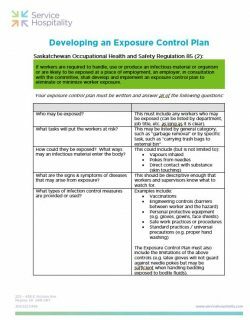 If your workers are required to handle an infectious material or organism or are likely to be exposed to one, then you must have an Exposure Control Plan in place. These are not just for hospitals. Any workplace with public washrooms is a likely contender, as well as those that host the public for overnight stays, or who handle any kind of laundry. It also includes organizations that provide care to individuals, as bodily fluids may be present. When we start to look at it more broadly, you can see that most employers are probably in need of an Exposure Control Plan. But the good news is you don’t need one as lengthy as a hospital. You just need one that works for you. And even better news? Your OH&S Committee can help in the development and review of the plan. In fact, having workers involved in the development of the plan and the implementation of the controls helps to secure buy-in and understanding. To help you out, Service Hospitality has developed a guideline for you to follow. Just make sure all the questions have been answered fully. And then make sure your workers get the training they need (don’t worry – this is included in the guideline too!). If you still don’t think you have enough information, let us know! We can help walk you through the process. 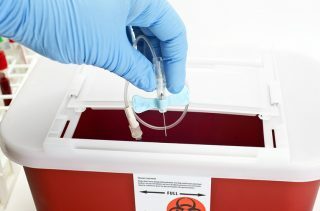 Service Hospitality also offers an in-person training session on Needles & Infectious Body Fluids that includes both the Exposure Control Plan requirements, as well as some helpful safe work practices for you to adopt.